It’s a perfect location for exploring the island with a great space to relax in as well. We were a family of 4 with grandparents and my sister staying too. All of us were happy and catered for. Lovely time thanks. I was in the ground floor bedroom. There was fluff on the floor and behind the bed. The duvet cover was far to big for the duvet. I was woken each morning by a very loud pump in the garage, opposite the room. Some form of insulation is a must. I would recommend the West Bay Club and Spar, out of season, as it represented good value for money. Looking at your summer price list I certainly wouldn't consider visiting as it is, in my opinion far to expensive! Apart from these small issues the break was a great success. The only small criticism I wound make is that some of the walls could do with a lick of paint. A superb four bedroom house located at The West Bay Club & Spa on the picturesque Isle of Wight. Set over three floors, this modern and contemporary house features spaciously appointed accommodation that is the perfect setting for a family holiday or for groups of friends looking to spend time together in this wonderful location. The first floor living area affords exceptionally spacious accommodation and the well-equipped kitchen will be adored by chefs. Dine alfresco on fine days and enjoy the benefit of your own private garden area or join fellow guests in the large gardens, a great place for games with the family. 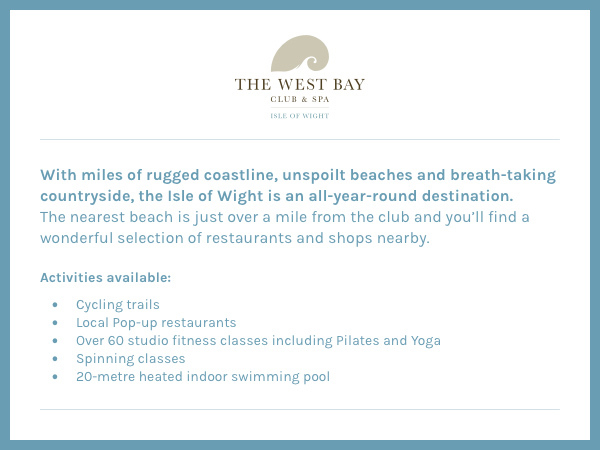 A stay at The West Bay Club & Spa comes with free guest membership to the Country Club and there are a plethora of activities to suit any age. There are bespoke children’s programs either in the pool or on dry land! Adults can avail of the well-equipped gym, partake in one of the 60 fitness classes that take place every week or truly unwind in the Island Wellness Spa with treatments that will invigorate body and mind. There are guided cycling tours available, outdoor tennis courts and you can even arrange to go scuba diving or surfing! All of these activities are run by enthusiastic and knowledgeable staff who will do everything possible to make your stay a memorable one. Over three floors. Four bedrooms: 2 x second floor double (one with en-suite shower, basin and WC), 1 x second floor twin, 1 x ground floor single. Ground floor shower room with shower, basin and WC. Second floor bathroom with bath, shower over, basin and WC. First floor living area with kitchen, dining area and sitting area with woodburning stove. First floor balcony with furniture.